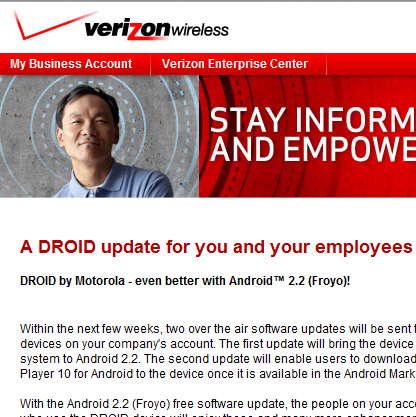 It looks like the Droid has a second over-the-air update headed its way. The first, which started being pushed out yesterday, was FRG01B and brought Froyo to the most popular Android around. However, a Verizon email tells us that this second update will give Droid owners the ability to download Adobe Flash 10.1, leading us to believe that it is indeed the leaked FRG22 build. If you’re already enjoying Froyo on you Droid, keep an eye out for a second update, and let us know when it comes.